We know the word "centerfold" isn't usually associated with hosta publications, but we just couldn't resist. Really, as the definition of the word at left makes clear, it just refers to a fold-out page in the center of a magazine. 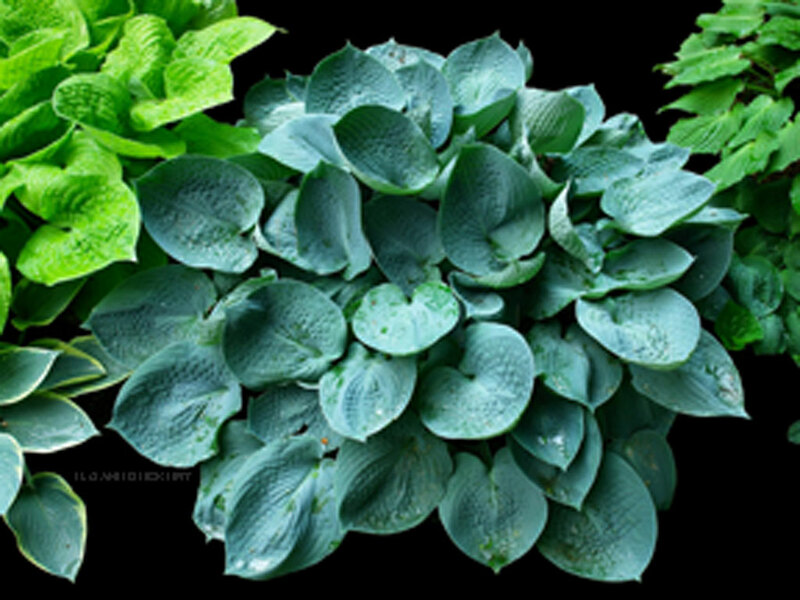 Since we are a hosta publication, our "centerfold" is a great hosta photo selected by our Photo Editor Rick Schroeder. The Hosta Journal in it's decades of history has never yet had a centerfold. Because this Online issue isn't actually on paper we can't have a fold-out page, so we did the next best thing. We created computer wallpaper for our readers so they can hang our centerfold on their virtual wall - the desktop of their computers. To get your official AHS Hosta Journal wallpaper, you first need to check your monitor's resolution. Instructions on how to do this are included below. Then click on the size that corresponds to your resolution in the smaller thumbnail pictures below. That will open the picture in its full size. Then follow the instructions on how to capture the picture and place it on your desktop as wallpaper. To find your screen resolution, first check the box to the right. If a number is displayed there that's all you need to do. If you do not see a number, please read "Checking Resolution" below for instructions on how to check it yourself. Find your size on the chart below to determine which Centerfold you need for your computer. If your numbers do not match one of the sets below, then go with the Shape, either Standard (small or large) or Widescreen. Then select the Centerfold below that matches your computer's resolution, but don't click it yet. Windows Users: First click the Centerfold above that is the correct one for your computer. This will open a full-size version of it. Then right-click the big version and choose "Set As Background". Mac Users: First click the Centerfold above that is the correct one for your computer. This will open a full-size version of it. Then right-click the big version and choose "Set As Desktop Background". If you want more control over how you set up your wallpaper, you can download your centerfold and save it on your computer. Simply right-click and save the image. In Windows you then right-click the desktop, choose "Personalize", then the "Desktop Background" link, navigate to where you saved the picture, select it and click on "Save Changes". On Macs, right-click on the desktop and choose "Change Desktop Background". Checking Resolution: If your resolution did not appear you will have to find it in your computer's settings. First try clicking HERE. If that worked you can go back up and continue getting your centerfold. If that page did not appear, you'll have to get the setting yourself. Windows Users: Right-click on the desktop and choose "Properties", then choose the "Settings" tab. On the page that comes up you will see a box that says "Screen Resolution". In that box you will see your resolution setting displayed. Mac Users: Open the "System Preferences" from the apple icon in the Apple navigation toolbar. Click on the "Displays" icon under the "Hardware" category. The resolution you are using will be highlighted. 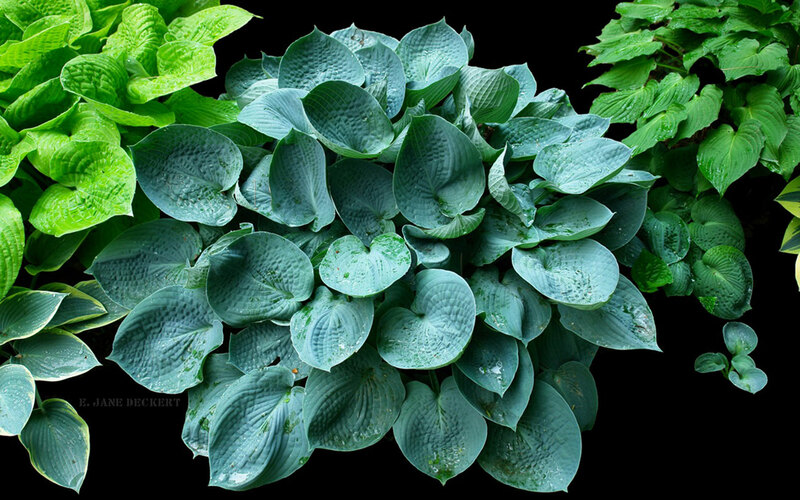 Hosta ‘Planet X’ was named following a visit to the Maryland Deckert gardens in 2004 by Mark Zilis. We had a section in the gardens where seedlings determined by Emile to show promise had been planted. After the success of ‘Blue Mouse Ears’, we had thought it would be nice to have a collection of "Deckert Hostas". As Mark studied all of the seedlings, one of his selections he deemed worthy of being named, registered, and tissue cultured was ‘Planet X’. This centerfold photo taken in 2012 is the largest specimen now existing in our gardens. It has turned out to be a stunning, robust, slug-resistant beauty. With age, it appears somewhat darker, following transplant to a heavier filtered sunlight exposure.